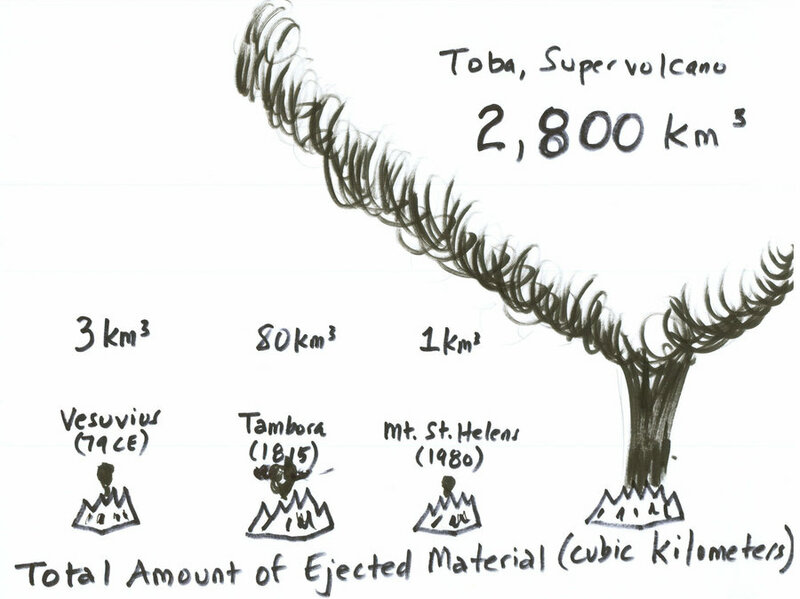 Did the Toba supervolcano almost wipe out humans? Humans are smart, adaptive, and have great technological prowess. But all of that doesn’t amount to much when nature hits you hard. Which it did around 75,000 years ago with the Toba supervolcano1. This super-eruption was the largest explosion on earth in the past 25 million years. It launched material more than 40 km into the air, blocking out the sun. The temperature plummeted several degrees for 1,000 years2. Understandably, these weren’t great circumstances for our fledgeling species. Still trapped in our African homeland, our population plummeted to just a few thousand individuals. We were almost wiped out3. Or at least, that’s the traditional story. 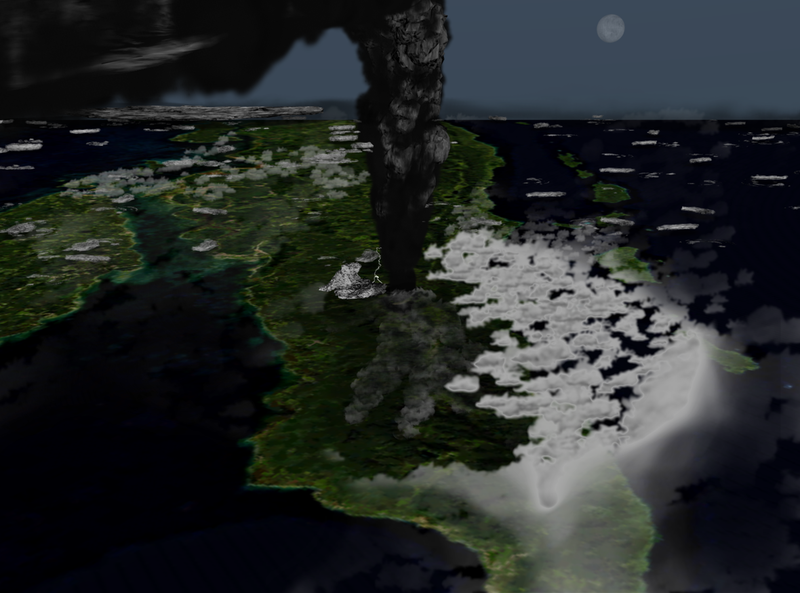 A plethora of new evidence is challenging the idea that the Toba super-eruption was actually a big problem for our species. Let’s see if it’s enough to blow-up the conesnsus. The ash and detritus from the Toba super-eruption made it more than 8,000 km to South Africa. There, these materials rained down as microscopic shards of volcanic glass, called tephra2. As well as hammering home the destructive nature of the eruption, tephra is great for identifying where people were living at the time of the eruption. If the sediment at an archaeological site contains some tephra, early humans probably called it home when Toba kicked off. Thanks to this, palaeoanthropologists found two such sites in South Africa, about 9 km apart. They gave them the creative names of Vleesbaai area B (VBB) and Pinnacle Point Site 5-6 (PP5-6). You don’t have to remember them, I’m just including them for completeness2. The important thing you do need to remember is that both of these sites were occupied before, during, and after the eruption. So we can look to see if it had any impact on the lives of the people there. Were they wiped out? Did their numbers drop? Were they forced to migrate further from the volcano? It turns out none of these dramatic scenarios actually happened. The humans living at VBB and PP5-6 carried on as normal during this period. There’s no sign of a population crash, forced migration, or any other major impact on the site. The number of tools made, and thus life, seems to have continued as normal2. 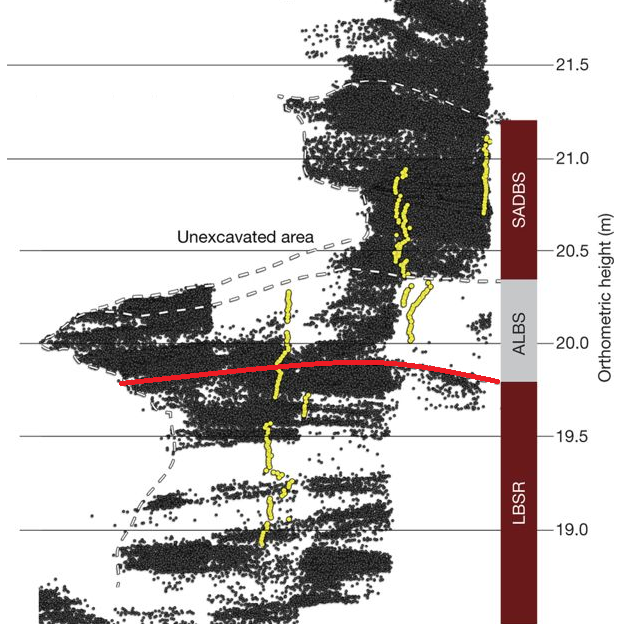 In fact, archaeological material even seemed to increase after the eruption at PP5-6. Plus, there were several technological shifts as new, improved technology was invented. People weren’t just surviving, they were thriving2. That archaeologists studying the site think that sort of innovation is what gave the people living there an immunity to the volcano. They were so adaptable they could just ignore the fact the largest explosion in 25 million years just went off2. Plus, these people were living close to the coast of South Africa. The ocean is a pretty amazing source of food, enabling people to live in areas that would be otherwise uninhabitable2. Like the Innuit, whose diet of sea animals allows them to live much further north than landlubbers could4. At least, that’s what the researchers studying PP5-6 and VBB concluded. These people were adaptable enough (and living in the right environment) to survive the Toba super-eruption2. But others think that luck and innovation didn’t have much to do with it. Perhaps that supervolcano, contrary to what the name implies, just wasn’t a big deal in the first place. Ok, I take that last sentence back. The supervolcano was a big deal if you were living near it. But most humans at the time were living in Africa. Some speculate that the eruption wasn’t a big deal for people living there. Hence why the people in South Africa could flourish. And here’s more evidence for this speculation than anecdotes from South Africa. Another group of researchers went to East Africa, where tephra from Toba has also been found in sediments at Lake Malawi. Being in the middle of a lake, no humans lived there around the time of the eruption. However, microscopic traces of nearby plants – called phytoliths – did wind up in the lake, providing a handy record of what the environment was like at the time of Toba1. 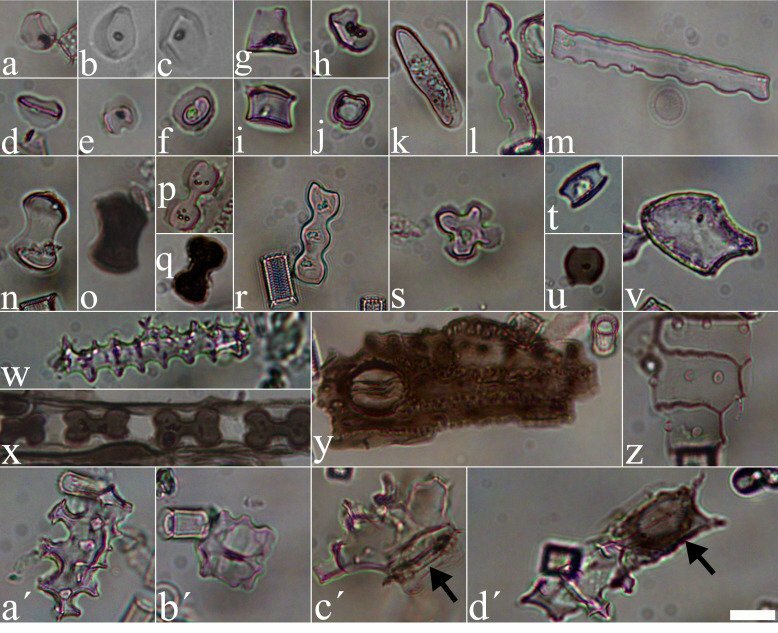 These phytoliths reveal there was some environmental change around Toba. Several species of grasses died off in large numbers, suggesting a drop in rainfall and temperature. However, these changes aren’t significant enough to imply a full-fledged nuclear winter. Trees and several other plants kept going strong, and the grasses also grew back shortly afterwards1. All of this seems to seems to indicate that the Toba eruption wasn’t a massive deal for our ancestors in Africa. The data from just South Africa is circumstantial, but when combined with these phytoliths a clearer pattern emerges. Humans thrived through Toba not because of innovation or intelligence, but just because it wasn’t a big deal. Genetic studies do seem to back this up. Whilst initial research found a population drop associated with the eruption, further work has failed to replicate it1. Our ancestors got lucky. Toba was a massive deal for a good chunk of the world. But we were living in just the right place to avoid the worst of it. Of course, now we’re working on rectifying this oversight by causing climate change the globe over. This time, luck won’t save us. Smith, E.I., Jacobs, Z., Johnsen, R., Ren, M., Fisher, E.C., Oestmo, S., Wilkins, J., Harris, J.A., Karkanas, P., Fitch, S. and Ciravolo, A., 2018. Humans thrived in South Africa through the Toba eruption about 74,000 years ago. Nature, 555(7697), p.511. Binford, L.R., 2001. Constructing frames of reference: an analytical method for archaeological theory building using ethnographic and environmental data sets. Univ of California Press. You must not not be so sure that Southern Africa won’t be the savior of humanity again Adam. Earth also has the risks of more ice ages and other lessor volcanic eruptions in the northern hemisphere. Remember the flow/actions of the sea’s currents and the global winds at the equator !. In South Africa there is a little land locked country called Lesotho which has been ecologically ruined to the extent that there are hardly any rats or crows left in it, some of us feel that that is why we are stationed in Southern Africa. To protect it from being ecologically destroyed in the term. Man’s influence on the global ecology might just have a radical influence on the onset of the next ice age and Europe and the America’s could be in for a very serious experience. It will be stupid to ignore those possibilities. Educated, civilized people should think globally today. South Africa did seem to get off relatively lightly in the ice age, although the lack of rainfall (as a lot of water was trapped in ice) meant arid environments expanded the world over; including in South Africa.